Photographic proof that March came in like a Lion but went out like a Lamb. Of course, it could also be proof that even boaters follow the age old Chicago rule of using old furniture to claim "dibs" on their favorite parking spots (slips). The chair, though, didn't hold up too well, the top part of the back seems to have broken during the month. 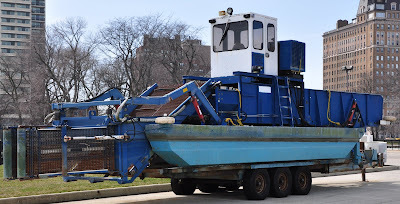 I've seen this vessel in the harbors around Chicago. 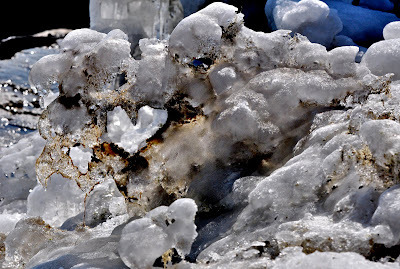 Until now, though, I've only seen it in the water as it draws up surface debris (leaves, paper, cups, etc.) 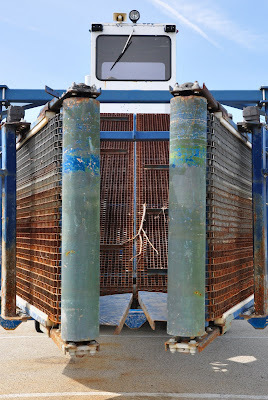 from the water during the Spring, Summer, and Fall boating season. It's like a vacuum cleaner for the marinas. 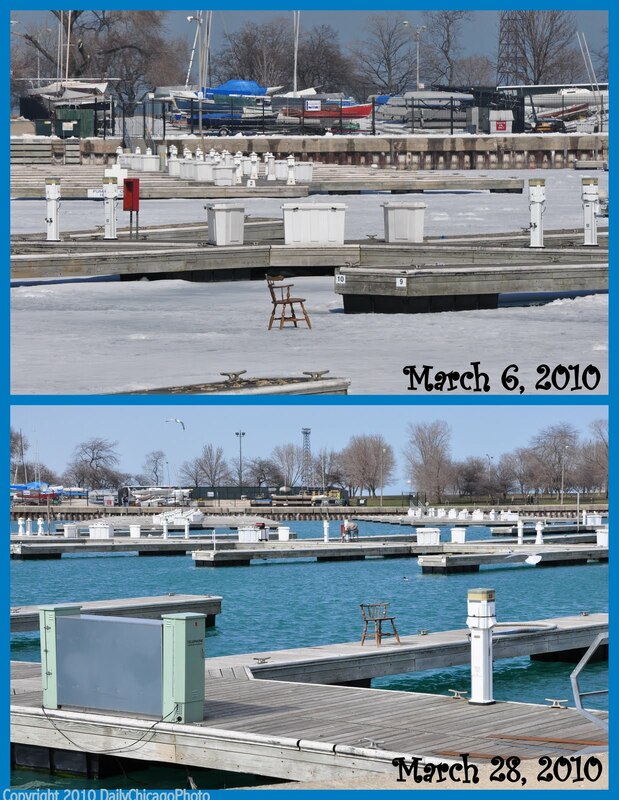 It's not quite boating season yet but the harbors are getting ready: the "No Wake" buoys were placed in the "playpen" (Ohio Beach), the mooring buoys were set in Monroe Harbor, and they did a little bridge lift testing late last week. And now the Trash-erator is getting ready to be launched. 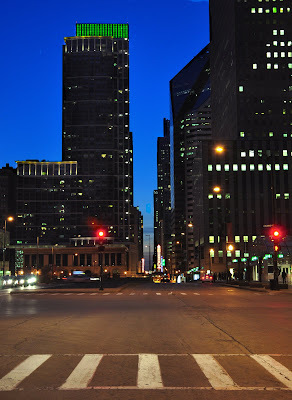 Continuing on the Lights theme, here are the night lights of the city: street lights, street lamps, head lights, tail lights, building lights, neon lights, and the end of a sunlit sky. 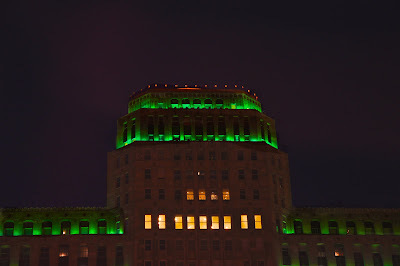 Yesterday's photo was of a building with artificial lighting. 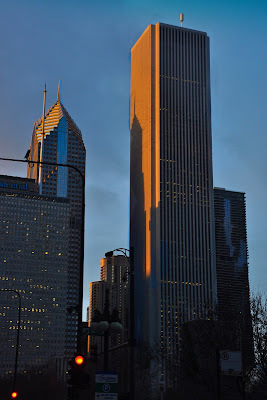 Last evening, though, the Amoco Building (or Aon Center or Standard Oil Building) was glowing with all natural sun(set) light. 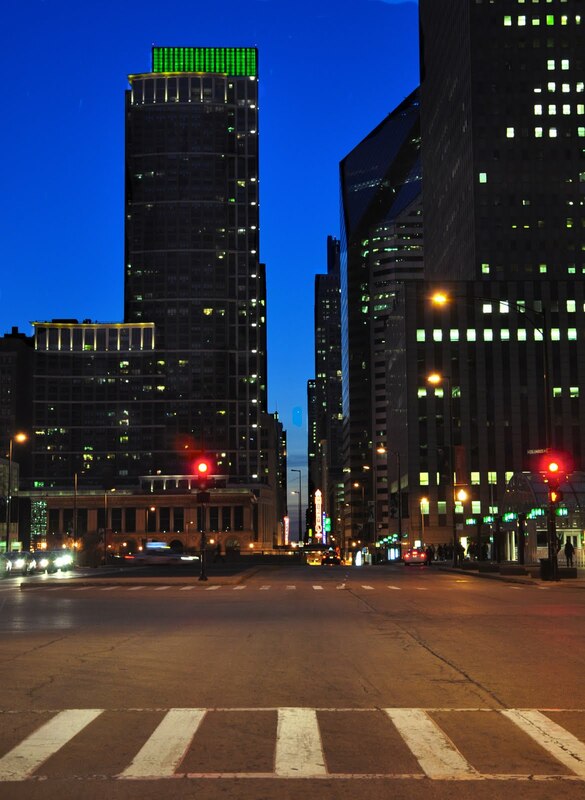 The Merchandise Mart, at night, with special lighting. 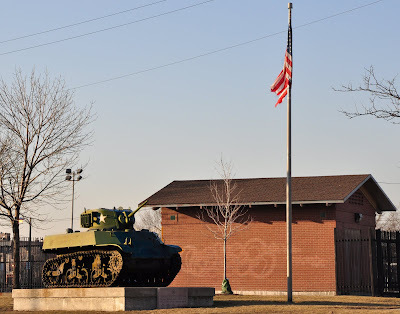 Just in case one of the suburbs gets any ideas about a land grab, Chicago is prepared. We have a tank. Actually, I think we have a few tanks scattered around the city. 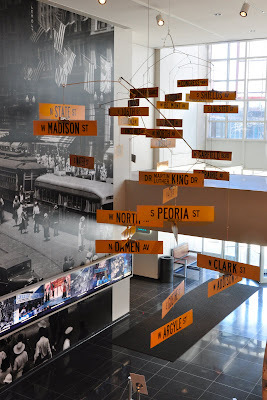 The Chicago History Museum has a rather interesting mobile hanging over the main entrance. 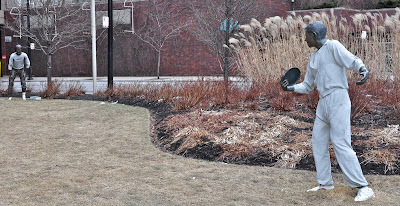 It is a mobile of notable Chicago area street signs. I thought the saying was "The Early Bird Catches the Worm" but maybe it is "The Early Bird Catches the Slush". After a brief visit, Spring decided it wasn't ready to commit full-time to Chicago yet so winter is back (slush is falling from the sky, it's in the 30s). But the mid-week Spring conditions did get the birds moving around a bit. 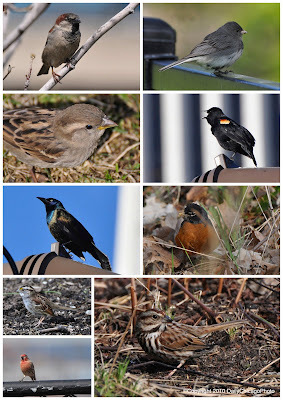 Here is a pictorial summary of bird sightings this past week. 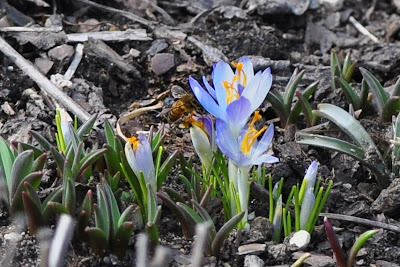 Crocuses are coming up in the Lurie Garden section of Millennium Park. I hope they are hardy because the forecast is for plunging (from 70 to 30) temperatures and snow this weekend. Please look for the little bee enjoying lunch in the garden. 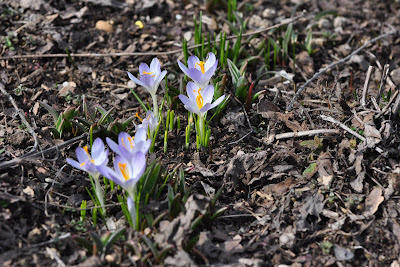 It is to the left of the most open crocus in the photo above. 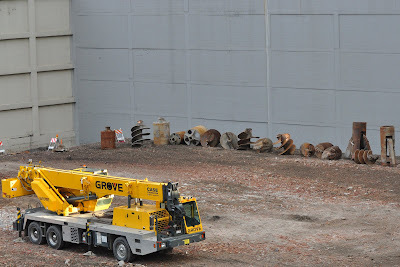 It's starting to warm up so it must be time to start construction season. 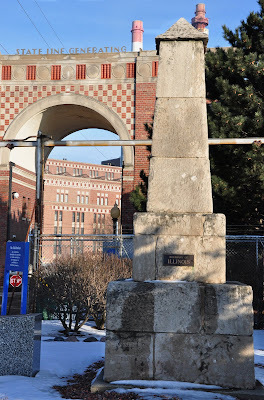 The Illinois-Indiana State Line Marker is the oldest structure in Chicago and is located in the East Side neighborhood of Chicago. Made of sandstone blocks, it was built in 1838 to mark the determination of the states' boundaries. According to a plaque on the monument, it was relocated 191.09 feet north of its original location. 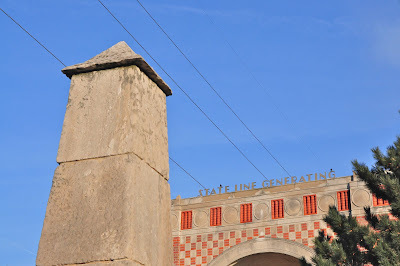 In the background of these photos, on the Indiana side of the monument, is the State Line Generating Plant. The title of this mural is "South Chicago - We All Come Together As One". 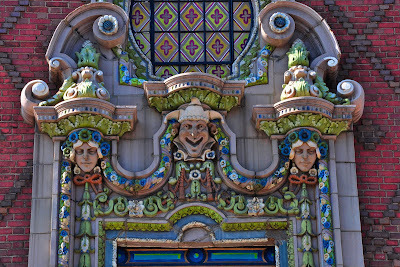 It is very colorful and has elements that you would definitely notice while driving around the area (the bridges, the religious symbols, the housing styles). The mural was created by an artist named Gamaliel Ramirez, with assistance from students and residents of the neighborhood. He is also the artist that did the Sea of Flags mural in Humboldt Park that was the subject of a September post. I have to admit I'm thinking of e-mailing the artist as I am curious about one of the symbols in the mural. To the far right (next to the Native American chief) is what looks like a large stalk of asparagus with eyes and blue symbols. It HAS to mean something to area residents and I am curious as to what it really is. 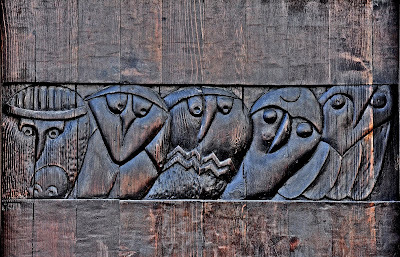 Found this interesting carving of birds (maybe artistic owls?) 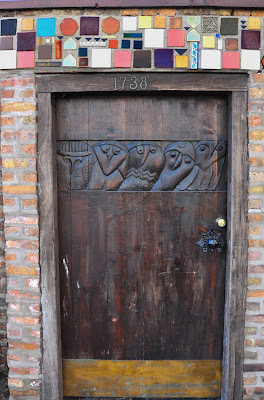 on a door in the Old Town section of the Lincoln Park neighborhood. The full doorway, which is also pretty fancy - is below. Yesterday was Chicago's 173rd Birthday. The Chicago History Museum celebrated by having a free admissions day. The museum has a number of interesting regular exhibits and special events. 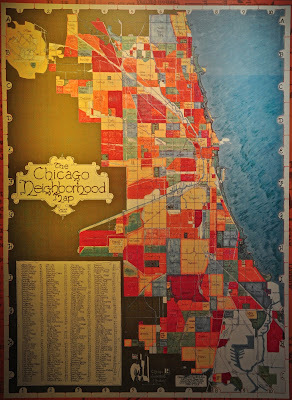 One exhibit focuses on the uniqueness of Chicago neighborhoods and includes this map showing the names and boundaries of each. It is rather interesting how each neighborhood has its own "personality", allowing you to feel as though you are traveling without ever leaving your home city. Must be something about early March and the almost Spring conditions that brings out some pretty sunrises. 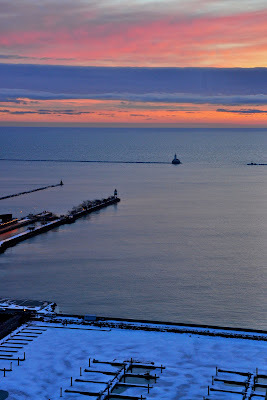 Purely coincidentally, I posted a sunrise photo last year on March 3, too. 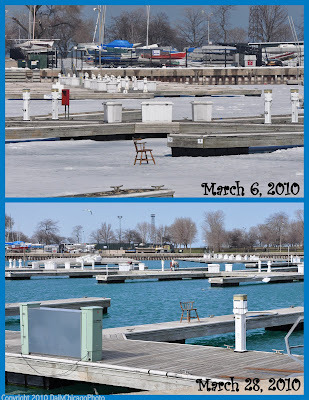 The sky looks springlike but, as you can see, the marina is still full of ice and snow. And, they are predicting 50 degree temperatures for later in the week (which was the same forecast for "later in the week" last year, too, according to my 2009 post). I waited around forever for this guy to throw that frisbee. I finally gave up and just took the photo. The saying goes "March comes in like a lion and goes out like a lamb". (Although that is not always true because last year it came in like a lion and went out like a lion, too. So not fair.) But at least it is now Spring (from the meteorological perspective). 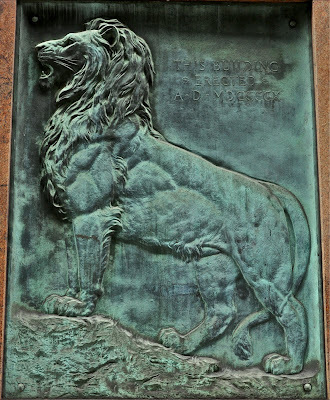 On the lion note, though, this seems to be the original Hubert (the Harris Bank Lion). 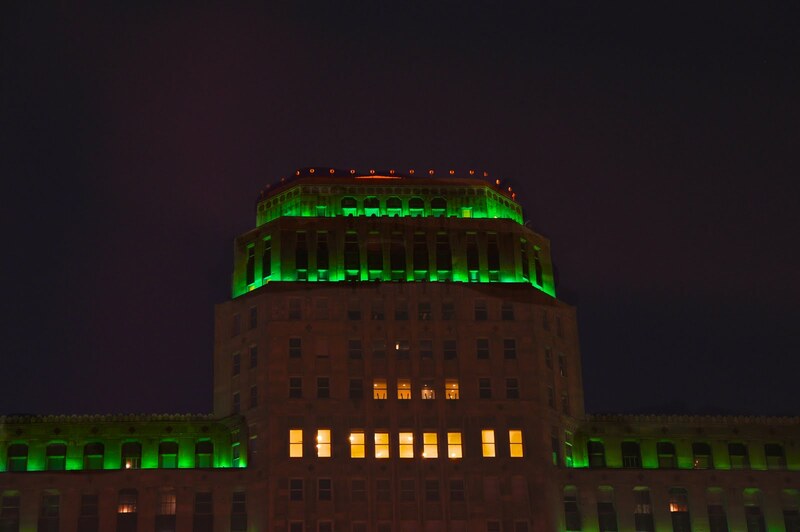 It is on the Harris Bank Building built, if my roman numeral translation is correct, in 1910.